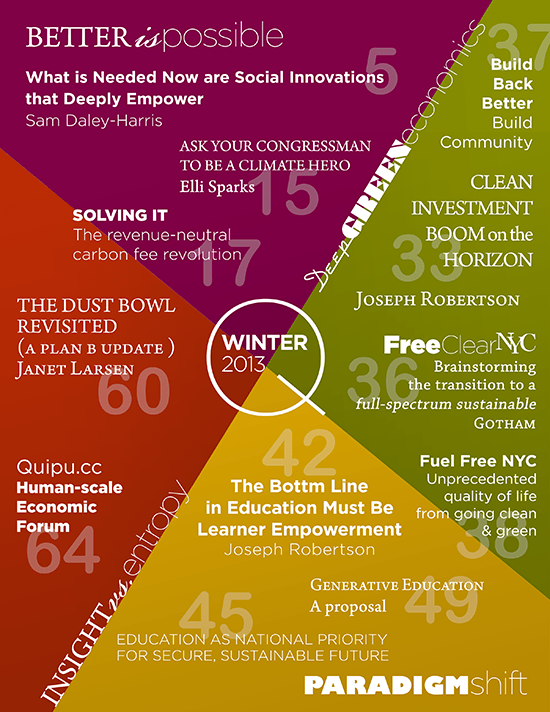 The Winter 2013 edition of the HotSpring Quarterly was released one day after the 2nd inauguration of Pres. Barack Obama. It once again focuses on innovative projects for building a clean energy future, a more participatory democracy, and a human-scale foundation for major social change. Sam Daley-Harris tells the story of his Center for Citizen Empowerment and Transformation, and highlights the collaborative volunteer model he brought to life through RESULTS, the world-altering anti-poverty grassroots lobby he founded, and the work of volunteers following the same model with Citizens Climate Lobby. Elli Sparks, one of those volunteers, rewrites the story about a child who gives a mouse a cookie, and asks readers to have the vision and the faith required to genuinely ask their representatives in Congress to become climate heroes. Janet Larsen’s Plan B update, for the Earth Policy Institute, revisits the Dust Bowl and examines the catastrophic drought that spread across the Great Plains in 2012, affecting US domestic and international food supplies. The impact of global climate destabilization is felt in phenomena like the 2012 drought, rising sea levels and the unprecedented hybrid superstorm known as Sandy, which struck the mid-Atlantic coast of the US on October 29, 2012, and affected 21 states. In New York City, New Jersey and other affected areas, it is possible to “build back better”, which means to build a new kind of urban and transport infrastructure, not only able to withstand Sandy-like storms but also allow for fuel free transport, greater mobility, less time wasted in transit, and an overall better quality of life. In this edition, we announce the FreeClear NYC project—an online publication aimed at brainstorming the full-spectrum sustainable Gotham—and Quipu.cc, the new incarnation of the Quipu project, a worldwide economic forum designed to report on economic reality at the human scale. We also propose a generative model for funding public education, including an overall focus on learner empowerment. And, last, but certainly not least, we explain how a carbon fee and dividend plan, promoted by citizen activists from around North America, and supported by leading climate scientists, economists and even some conservatives. To learn more about carbon correction fees, household reimbursement and solving the climate crisis, read the Quarterly, or go to Solving It.